Village Hotel Changi, Singapore, Singapore - Lowest Rate Guaranteed! When you stay at Village Hotel Changi in Singapore, you'll be next to a golf course, just steps from Changi Point Ferry Terminal and 3 minutes by foot from Changi Village Food Centre. 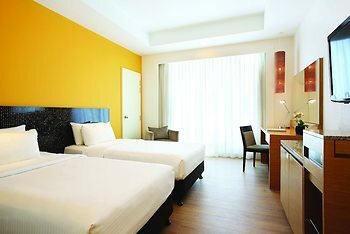 This 4-star hotel is 1.8 mi (2.8 km) from Sree Ramar Temple and 2.7 mi (4.3 km) from Changi Beach Park. 6th floor room with balcony. 6th floor lounge pleasant and very helpful staff. Appeciated complementary options such as laundry, shuttles. We enjoyed the swimming pool on the roof and the location of the food courts and restaurants all walking distance. The free shuttle bus service too and from the airport is on time which is excellent. Friendly staff. Flexible enough to find us a room with a window that opened. Shuttle service is very good. Very friendly driver. Comfortable beds. I always have a problem with air conditioned rooms that are sealed especially after a long flight. More rooms with opening windows would be good. The location is far from an MRT station so more information about buses would be useful. Very good service. I asked for our room to be changed because air conditioning affects my throats and I needed to be able to open a window. Done immediately, as soon as I asked. Just the fact that many rooms are sealed with windows that can't be opened. After a long plane journey it's good not to be sealed in a room with air conditioning all the time. Reception Staff and door/porter were very helpful, especially the young doorman who was there most of the time and was extremely helpful. Was not overly happy with the room. They had given our room to someone else and feel we were put in a room that was rather outdated, though everything was there that was needed. The staffs helpfulness in other areas certainly made up for it. Staff were very cooperative, room service perfect. I was very satisfied for my seven nights. We had a very comfortable time;this hotel is an excellent location for stopovers, especially if you are wanting a 'nature" rather than a city break. You can start and end the day in the brilliantly positioned rooftop Infinity pool and fill in the day offshore cycling thru gentle tropical jungle on Pulau Ubin Island. Free Airport Shuttle and free one way transport to Singapore City. Dining room waiters in-efficient, not attentive. $2 difference between a simple Continental breakfast and large American style breakfast not explained. Room had obvious air-conditioner leakage in the past, which was not fixed.